We are specialists in the kitchen cabinet design industry with over 27 years experience. We are dedicated to providing our clients great quality products and excellent customer service. Canadian Custom Cabinetry & Design Home Options Made Easy is a renovation company that does it all including exclusive design appointments at our Design Center. Specializing in renovations, remodeling, alterations, custom build, interior design, and products. It all starts at H.O.M.E. When you visit our design center, our products instantly speak for themselves in their quality and appeal, but you may need a few minutes more to appreciate the services we provide. Whether you’re a DIYer, working with a contractor, or you need us to help with every step of your project, you can count on us. 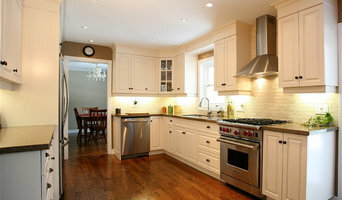 What we do: Custom Cabinetry and Finishings We specialize in Canadian cabinetry that is customised to your design needs. We work together with local suppliers such as Tile Master, Irvines, Beaulieu Flooring, Emco Plumbing, Marathon, Barrie Trim and Mold, Glass Doctor and many more to have everything you could ever need to finish your space in one easy location. Design Services Our in-house designers have a background in Interior Design, staging and first-hand experience on the job sites. Our whole team is friendly and approachable. They’re looking forward to discussing your kitchen and your ideas, and their expertise will help you to make informed decisions about cabinets, fixtures, hardware, and more to ensure everything works together seamlessly. Whatever your style, we’ll help you create a kitchen you love, from how it looks to how it flows and functions. Designs include, 3D Renderings, Architectural Design, Architectural Drawings, Building Design, Custom Homes, Drafting, Energy-Efficient Homes, Floor Plans, Green Building, Home Additions, Home Extensions, Home Remodeling, House Plans, Site Planning, Sustainable Design, Interior Design, Kitchen Design, Bathroom Design, Full Home Design and more. Renovation Contractors Our renovation team has a collective contracting experience that exceeds 35 years. In collaboration with you, our designers, and our suppliers, we’ll transform your kitchen from everyday to exceptional. Come visit us at 130 Saunders Rd, Unit 7, Barrie Areas Served Barrie, Muskoka, Collingwood, Aurora, Orillia, Port Severn, Toronto, GTA, Newmarket, Burlington, Oakville and more. Sandra Thomson is a true visionary. She has been in the industry for over 26 years and specializes in interior architecture for your home and cottage. Since 1993 Total Living Concepts has been providing total home renovation services including; additions, structural changes, and kitchen and bathroom design. MAJ Interiors is a Toronto-based residential and commercial interior design firm with a mission to transform spaces into majorly beautifully statements. Whether designing a contemporary, modern or traditional space, every project is carefully observed and orchestrated with impeccable expertise in order to complete projects on time and on budget, with consistently pleasing results. MAJ Interiors strives to achieve elements of intrigue by pushing boundaries while discovering our client’s dreams. Reinventing each space by introducing new ideas, finishes and a splash of personality is our specialty! By recognizing and acknowledging the pleasures of life, each design element becomes an opportunity to establish the perfect balance between practicality and sophisticated indulgence. We would love for you to contact us to discuss your future project and schedule a design consultation to help you put together an action plan for achieving your dream space! Toronto Kitchen and Bath Designers Best of Houzz 2014, 2015 and 2016! 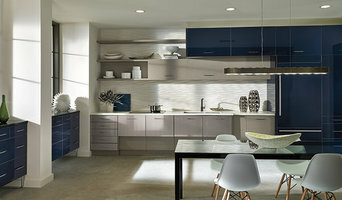 Manufacturer of high-end custom kitchens & cabinetry. We specialize in framed cabinetry with inset doors built in the English traditional techniques for long lasting seamless beauty of fit and finish. Our goal is to provide you with the best quality kitchen cabinets and appliances. We are the exclusive dealer of Leicht - Germany's premium kitchen cabinets brand in Ontario, and represent Premium German Appliances: Miele, Gaggenau and AEG. Stop by our showroom in Richmond Hill and let us treat you to a cup of coffee and show our amazing products! We are currently offering up to 15% off the kitchen price when you order before Sept 1, 2018! Please contact us for more information. We are located on: 10800 Bayview Avenue, Unit 7 Richmond Hill, Ontario. Purveyors of fine custom cabinetry and innovative design solutions, Paragon Kitchens has been transforming residences throughout Southern Ontario for over 25 years. A Paragon kitchen is the ultimate complement to your custom home or renovation project. Cranberry Hill Kitchens is a proud, Canadian-owned company that has served satisfied clients since 1989. We entered this business because we identified a need for a designer and manufacturer of high quality residential custom cabinetry. Our key combination of quality, experience, knowledge and personal service is what ensures that all of our clients’ projects are a success. All of our cabinetry is both custom designed and manufactured. The same cabinet makers that build your furniture will also install it in your home. This unique process ensures quality, and fosters great pride in our work on your project. Most of our work is centered in Ontario and Quebec, yet we have been pleased to extend our services to clients in Nova Scotia & Newfoundland and even south of the border in New York and Michigan. Chervin Kitchen & Bath Inc.
Two (soon three!) locations to serve you better - Port Carling, Waterloo, and Oakville (coming soon!). Since 1991, Chervin has been designing, manufacturing, and installing high-end custom cabinetry in homes across Waterloo Region. Over the years, Chervin has expanded to serve the GTA and the Muskoka region, and to build and/or acquire 4 sister companies (in addition to its founding company, Chervin Kitchen & Bath). These expansions have given us the opportunity to be a key player in the markets for high-end, custom residential cabinetry, luxury hotel furniture, residential furniture, custom upholstered furniture, and unique clocks and home décor. We are a family-owned and family-run business, with a team of over 200 individuals pursuing “The Golden Means of Perfection.” This means, in part, that we strive to live by the Golden Rule (“Do unto others as you would have them do to you”). We do this by staying detail-obsessed, filled with integrity, and driven by purpose, so we don’t just meet but exceed our customers’ expectations. We create products that seamlessly integrate style and function, and develop fresh innovations to fit the unique needs of our customers. We’re growing more every year, and we hope you'll join us on the exciting journey ahead! Sandra Cross Interiors Inc. is an award winning firm that specializes in interior decorating and design for residential clients in the Greater Toronto area. Our interiors are elegant and tailored yet very livable and always comfortable. Whether decorating a single room or embarking on a larger renovation we bring our creativity, vision and energy to every project and to each aspect of the design process. Thoughtful design, a commitment to detail, quality furnishings and finishes, dedicated project management and a desire to enhance your lifestyle result in beautiful and personal interiors. At Lucvaa Kitchens we offer the latest design trends, working together with our clients to design and select custom cabinetry, finishes, & hardware. We are committed in building long-term relationships and providing exceptional customer service from the initial design consultation to the completion of our client’s designer kitchen and other home cabinetry. At our manufacturing facility in Etobicoke, Ontario, we have successfully blended the traditional techniques of cabinet making with the modern technologies and software. We are backed by a team of talented professionals with over 20 years of experience in management, designing, cabinet making and installation to ensure our quality and innovative design concepts exceed the industry standard. The ability to craft each piece in our own workshop is both beneficial and economical for our clients who have one thing in mind – their dream kitchen within their budget, without any compromise to quality. At Lucvaa Kitchens, we take pride in our focus on listening to the needs of our clients and then providing professional advice so that our clients can make informed decisions. The end result: a finished product that emanates beauty and quality at an affordable price. We are boutique custom design and build Kitchen company specializing in beautiful, Kitchens and Fine Cabinetry for every room in the home. We are passionate about creating elegant , functional, timeless cabinetry for our client's homes. We have two beautiful showrooms to display the actual quality of our work and our design sensibility. This allows our potential clients complete peace of mind when taking on such a large and important project within their homes. Lindsay Schultz Kitchens + Cabinetry Ltd., located on the shores of Georgian Bay in Midland, Ontario, designs, supplies, + installs high quality cabinetry + countertops for the home + cottage. We also carry a full line of plumbing fixtures + beautiful tiles. We offer a one-of–a-kind approach to the design process from our initial consultation to final installation. Not only will we work with you to design the space of your dreams but we provide full support from beginning to end as well as provide electrical, plumbing, + lighting plans to compliment each + every project. We are also a full project management firm + can provide full turn key services + complete your full renovation in-house. See for yourself! Our showroom is full of unique cabinetry styles in hundreds of lacquer finishes + stains. Countertops options can be seen in granite, quartz, soapstone, wood, solid surface, + more. Having a hard time envisioning your space? Not great with colour? No problem! We'll walk you through three dimensional drawings + help you select the finishes to make it come to life. From rustic to modern, traditional to transitional, you'll appreciate our special selection of products to set your kitchen or bathroom apart! We are now in our 30th year of business and are very proud of our reputation. We have made countless bathroom, kitchen and home renovations. Remodeling projects come to life with our dedicated designers, product experts, renovators and installers in and around Durham Region. In addition to unique product offerings, our biggest asset (and your advantage), is our experienced team and our installation crews. We aim to be your one-stop shop for your next home project, from free advice to expert installation. Our specialties include complete bathroom and kitchen renovations, ceramic, porcelain and slate floors, stone and quartz countertops, backsplashes, and heated floors, to name a few. Our Promise: When dealing with us, you can expect excellent communication and customer service through the whole project, top quality products and dedicated, "Old World" workmanship. Moico specializes in bathroom renovations in the Toronto Area. Remodeling tired old bathrooms into beautiful modern, better functioning oases. Our expertise includes IKEA kitchen and laundry room design and installations ; Fabulous transformations at a fraction of the cost of custom. Our team of independent trades ensure experts throughout your entire renovation; From design to final details. A team approach with clients, and our attention to detail, has lead us to many successful design projects and satisfied clients. Achieving flawlessly functional and attractive kitchen and bath design in Schomberg, ON requires a professional who specializes in these spaces. Not only do these rooms see the most action of the house, but they require the most planning and attention to detail. When designing them, a bath and kitchen designer must keep a strong focus on the homeowner's wants and needs while also considering things like potential resale value. Read the tips below to learn how to choose the perfect Schomberg kitchen and bathroom design professional for your home project. What does a Schomberg kitchen designer or bathroom designer do? A kitchen and bath design professional in Schomberg, ON knows to take all of these crucial points into consideration and can help plan the layout, materials and overall look and feel of either of these rooms in your home. Kitchen designers, as well as bathroom designers, are constantly staying on top of trends in the ever-changing industry. The designer also knows the best layout for your room, and can configure the layout for optimal functionality and utilization of the space. In the kitchen the refrigerator, stove and sink should be laid out in relation to one another, and it should be seamless and easy to move from one to the other. A Schomberg kitchen and bath designer will know how to work with a contractor and architect to plan the flow of the room to work best for your needs. Here are some related professionals and vendors to complement the work of kitchen & bath designers: Kitchen & Bath Fixtures, Appliances, Tile, Stone & Countertops, Cabinets & Cabinetry, Woodworkers & Carpenters. Before you talk to bath and kitchen designers in Schomberg, ON, consider how you will use the room. For your bathroom, is it necessary to have a bathtub for bathing kids or pets, or would a shower suffice? Perhaps all you need is a half bath for downstairs or a smaller guest bath for occasional use. Similarly, for kitchen renovations consider your cooking habits. Do you eat out every night but need a space to entertain in? If so, a smaller kitchen might be fine for you, with a space devoted to wine storage or a bar, whereas others might prefer a bigger stove or extra cabinets. When interviewing Schomberg kitchen and bath designers, make sure to share these habits so they can best fit the room to suit your needs. Find a Schomberg kitchen designer or bathroom designer on Houzz. Narrow your search in the Professionals section of the website to Schomberg, ON kitchen and bath designers. You can also look through photos in Schomberg, ON to find a kitchen or bathroom you like, then contact the professional who designed it.